Explore the St. Simons Lighthouse Museum in the Keeper’s Dwelling and discover the fascinating history of Coastal Georgia through colorful exhibits of rare artifacts, historical photographs, and interactives designed for the whole family. The development of lighthouse technology is also traced. See the Plan Your Visit page for hours, location, and contact information. Click here to purchase Admission tickets. In 1804, John Couper, owner of Cannon’s Point Plantation, deeded four acres of land at the southern end of St. Simons to the Federal government as the site for a lighthouse. In May 1807, James Gould was awarded the contract to build the St. Simons Lighthouse for $13,775. The project included plans for a dwelling house, separate kitchen, oil house, and well. Born in Massachusetts in 1772, James Gould moved south in the 1790s to survey timber. In 1810, President James Madison appointed Gould to serve as the first keeper at an annual salary of $400. Gould acquired a cotton plantation on St. Simons and trained several of his slaves to maintain the Lighthouse. Octagonal in shape, the Lighthouse had a base 25 feet in diameter, tapering to 10 feet in diameter at the top. The tower was 75 feet tall, with 8 foot thick walls at the foundation. The first light, an oil lantern probably fueled with whale oil, was suspended in an iron lantern room ten feet tall. Gould’s lighthouse was constructed of tabby, except for the uppermost portion which was made of brick. Tabby, a building material often used along the southern coast, is a mixture of oyster shells, sand, water, and lime. The lime was made from burning oyster shells. Tabby salvaged from 18th century Fort Frederica may have been used in construction of the lighthouse. At the beginning of the Civil War, a Confederate earthworks fort was built west of the Lighthouse. On September 29, 1861, the local Glynn Guards Infantry Company blew up the Lighthouse to keep it out of the hands of the Union Navy. The Fresnel lens, installed in 1857, was dismantled and removed “to the interior” prior to destruction of the tower. When Federal troops landed in Brunswick, they searched for the lens to no avail. It has never been found. The current Lighthouse and Keeper’s Dwelling were completed in 1872. Orlando Poe, chief engineer for the U.S. Lighthouse Board, supervised the design. Charles Cluskey, architect of many outstanding buildings in Georgia, served as contractor from 1868 until his death in 1871. The Lighthouse is 104 feet tall and constructed of Savannah grey brick. It is 21 feet in diameter at the base, tapering to 10 foot in diameter at the base of the gallery. Its spiral cast iron staircase is encased within an 8 foot wide column, leaving space between the exterior and interior brick walls for the original rotational weight system of the lens. The decorative iron brackets supporting the Lighthouse gallery at the top echo the elements of Italianate architecture in the Keeper’s Dwelling design. Since 1872, a 3rd order Fresnel lens, made in France, has projected the light that guides mariners into St. Simons Sound. The light was converted from kerosene oil lamp to electricity in 1934 and automated in the mid-1950s, ending the need for a resident keeper. The light continues to be an Active Aid to Navigation maintained by the U.S. Coast Guard Auxiliary. The tower is painted solid white, known as its day mark. The original fixed light is surrounded by four rotating flash panels, resulting in a flash every sixty seconds — the night signature of the Lighthouse. By positioning the Lighthouse between two range towers to the west, mariners are safely guided into the St. Simons Channel and Sound. In 1971, the Federal government conveyed ownership of the Dwelling to Glynn County for use as a museum. Coastal Georgia Historical Society restored the building in 1975 and since then has operated the Dwelling as a museum of coastal history. 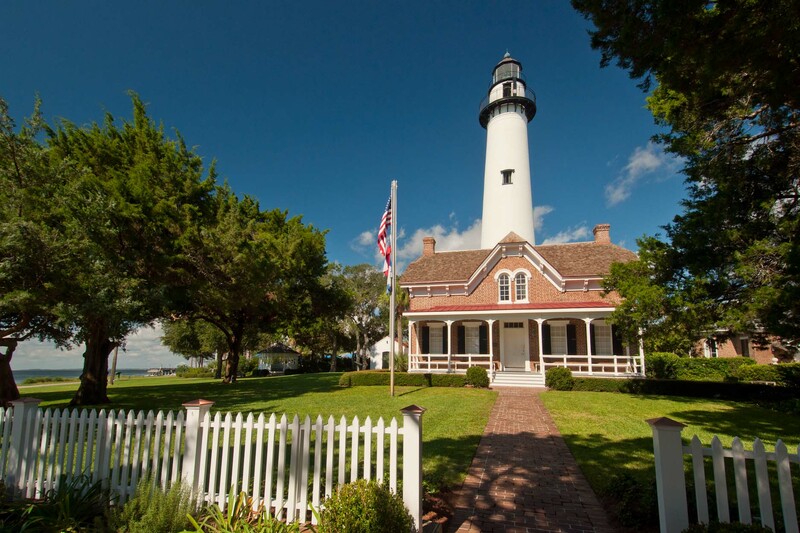 In 2004, the Society acquired the St. Simons Lighthouse under the National Historic Lighthouse Preservation Act. *On July 1, 1939, the U.S. Lighthouse Service was abolished and merged into the U.S. Coast Guard. From the time, the official title of USLHS Keeper was changed to USCG Officer in Charge, usually at the rank of Chief Boatswain’s Mate.